A simple, interactive PDF. Just enter in your required info, print and done! 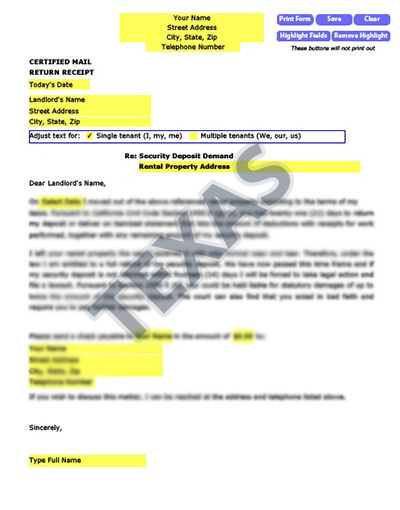 If you are a tenant in Texas and moved out of a rental property but the landlord has failed to refund your security deposit, even after sending them a request letter, then your next step should be to send them this Security Deposit Demand Letter, which has been written professionally to detail the state laws and sound a strong warning to the landlord. Having followed the lease agreement, paid all the rent and leaving the rental property without any substantial damages beyond the day-to-day wear and tear, the tenant has a right to get back full security deposit within 30 days after the end of their tenancy. Pursuant to the Texas state laws, a landlord who defaults paying the security deposit in time and withholds it in bad faith risks severe legal consequences if the tenant moves to court. Although you can challenge the issue in court, it could take some time to have the matter settled. By simply downloading, filling and sending this letter, you can easily prompt the landlord to repay the owed amount without needing to go to court. The letter lets the landlord know that you know your rights as a Texas tenant and that you can stop at nothing to see that your rightful security deposit is repaid. It is usually the best way to get back owed security deposit out of court when all other means have failed. Always make sure that any correspondence with the landlord is documented and in written form to avoid disputes in future. Send the letter through certified mail to get a receipt establishing the letter delivery. Our letters for Texas renters are tailored to your state, with the right laws to get your landlord’s attention. We’ve taken care of the Security Demand details so there’s no hassle on your part to find the right law and craft an approrpriate letter. Our letters have been used in Texas and all over America with great success.